It was July 1997 when Aimee fell hard. Half way through her geology degree and on a break from her summer job, she wandered into a drugstore and noticed a blueberry bundt cake staring at her from the cover of a magazine. She bought the magazine, made the cake, then several more recipes in that same magazine, each one better than the last. She was a changed woman! Aimee would finish her geology degree but leave rocks behind in a few years to pursue her real passion: the need to feed. After Aimee completed her Professional Cooking Diploma at SAIT in Calgary, the oil company she was working for was bought out. 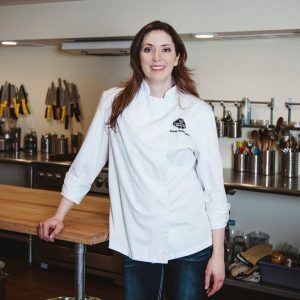 Declining a transfer to Texas, Aimee moved back home to Saskatchewan and soon started her own catering business, Evolution Catering and Fine Foods. 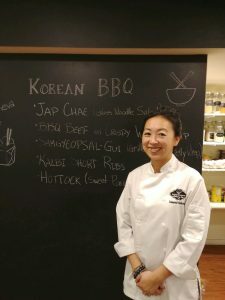 It wasn’t long before a customer suggested she teach cooking classes, so she started. Eventually another customer walked in and asked if she served lunch. So she started. Soon the landlord offered her the space next door. She took it. And Tangerine: the food bar was born. Evolution and Tangerine have both topped their categories in the Prairie Dog’s “Best of Regina” poll and Tangerine is one of only three Queen City restaurants listed in Where to Eat in Canada. Much to the delight of her foodie following, Aimee founded Schoolhaus Culinary Arts on a simple premise: There’s a chef in every one of us. She still has the magazine that first proved that true for herself. 2. What is your favourite food to make? Fresh pasta! Fresh noodles make any dish extraordinary. 3. Favourite to eat? PIZZA!!!!!! 4. What’s one dish that reminds you of your childhood? Peanut butter rice crispy squares. My mom would make them all the time. In fact, she still makes my birthday cake out of them every year. 5. If you could only eat one food for the rest of your life, what would it be? Pizza! or any type of chicken sandwich. 1. What is your favourite skill to teach? Chinese and Japanese knife techniques, but I really like to get beyond skills and the How we do things and talk about the history of food and food science to explain Why we do the things we do in the kitchen. 2. What is your favourite food to make? Moroccan Tajine, its both incredibly simple to make, but wonderously complex in flavour. It has a million variations, including absolutely crazy combinations of ingredients, but it just works. 3. Favourite to eat? Foraged wild food enjoyed fresh on site. 4. What’s one dish that reminds you of your childhood? Raspberry Pavlova was how my family always celebrated the start of raspberry season on the farm. 5. If you could only eat one food for the rest of your life, what would it be? Peanut Butter. I might not live long, but I’d die happy. 6. 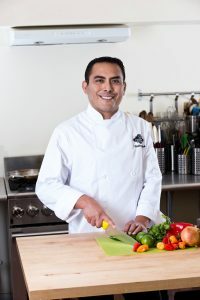 Favourite chef/inspiration? James Barber “The Urban Peasant”. He had a breadth of knowledge of world cuisine, but also a touch of irreverence, that cooking should be enjoyed rather than regimented. 7. 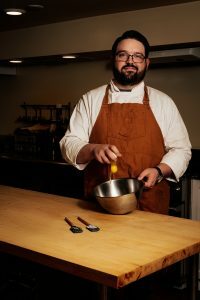 In one sentence, describe your cooking/food philosophy: Its better to learn one technique or theory than memorize a hundred recipes. 1. What is your favourite skill to teach? My favorite skill to teach would be anything baking. I love the science behind baking and how things like macarons and choux paste are very precise. 2. What is your favourite food to make? I love working with yeast to make anything related to bread and buns. I like working with yeast and having the time to create things like buns and bagels and braided breads, oh and donuts too! 3. Favourite to eat? Favorite food to eat would be pasta with just about any kind of sauce. 4. What’s one dish that reminds you of your childhood? spaghetti and meatballs baked in the oven. Yum! 5. If you could only eat one food for the rest of your life, what would it be? For the rest of my life, chicken with pasta because there is so much you can do with those two things to change a meal. 6. Favourite chef/inspiration? Inspiration would be damn_delicious.net and Sally’s Baking Addiction. Neither person has steered me wrong yet when I have been looking for a recipe. 7. 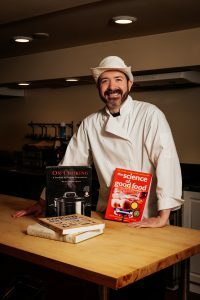 In one sentence, describe your cooking/food philosophy: I like to take simple ingredients and make new dishes to eat, using things that I already have in my house in new and creative ways. Stay tuned for his bio. 1. What is your favourite skill to teach? My favourite skill to teach is sushi. It’s almost like an art. All the steps to make sushi are important and precise and when you put it all together it creates beautiful food in the end. It’s great when people see how easy it is to make sushi and how delicious it is. 3. Favourite to eat? This is a hard question. I love food, I love to eat. I’m not picky, there’s nothing I won’t try and I’m not allergic to anything. I guess I would never say no to sushi but I also love seafood, prime rib, cheesecake or anything Chinese! 4. What’s one dish that reminds you of your childhood? A dish that reminds me of my childhood is Congee, Preserved Duck Egg Congee to be specific! Growing up in a Chinese home we always had congee when going out for Dim Sum or on a Sunday afternoon. It is the ultimate comfort food. As a child I always picked out the duck egg bits but now as an adult I love it and it brings me back to some great memories of growing up. 5. If you could only eat one food for the rest of your life, what would it be? If I could only eat one food for the rest of my life it would probably be pizza. Pizza is so versatile you could put anything and everything on pizza! 6. Favourite chef/inspiration? My favourite chef would have to be Jamie Oliver – I love his simple and rustic way of cooking and makes everything look so easy and delicious! 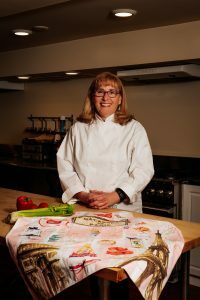 I also like Lynn Crawford because of her humor and how she takes fresh and locally grown ingredients to make a fun and delicious meal. We’re always looking for dynamic, creative, innovative – and most of all, fun! – instructors to join our team. 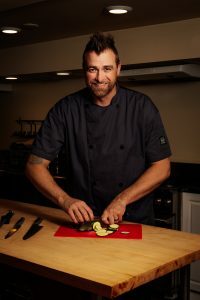 Whether you have formal culinary training or are just really passionate about food and sharing your experiences with like-minded individuals, we’d love to hear from you! Send your resume and cover letter to schoolhausculinaryarts@gmail.com and let’s talk food!